The Lobby Of This Seaside Resort Features Panoramic Views Of The Ocean, Marble Tables, Key West-style Fans And Tropical Plants. A Wide Veranda Offers Ocean-view Seating. Dining Options Include The North Ocean Grille That Offers Tiered, Ocean-view Seating And A Seafood Menu. Postcards Lounge Serves Poolside Refreshments, And The Emporium Ice Cream Parlor Serves Sweet Treats From Early Morning Until Late At Night. Function Rooms Accommodate Up To 75 People. Complimentary Wireless Internet Access Is Provided In Public Areas. A Business Center Offers Four Computer Stations. Recreational Amenities Include An Outdoor Pool And A Limited-hour, Complimentary Fitness Room Equipped With Cardiovascular And Weight-training Machines. A Limited-hour Concierge Provides Sightseeing Information And Offers Shopping And Dining Suggestions. 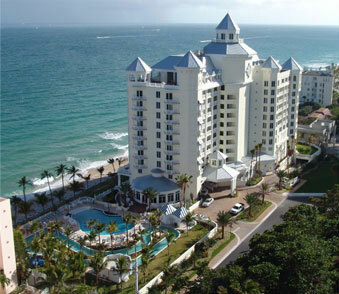 Pelican Grand Beach Resort Houses 156 Guestrooms Within An 11-Story Building And A Six-story Building. Most Of These Key West-inspired Accommodations Boast Step-out Balconies With Ocean Or Intracoastal-waterway Views. Décor Features Rattan Furnishings, Light Tropical Colors And Ceiling Fans. Rooms Include Microwave Ovens, Mini Fridges And Coffeemakers. Beds Are Dressed With Pillowtop Mattresses And 300-Thread Count Linens. Bathrooms Are Stocked With Crabtree & Evelyn Toiletries. Rooms Contain Microwave Ovens, Coffeemakers And Small Refrigerators. Laptop-compatible, In-room Safes Are Complimentary. High-speed Wired And Wireless Internet Access Are Also Complimentary. The Pelican Grand Beach Resort Offers Pastoral Amenities That Blend Well With The Floridian Lifestyle, Such As Lobby Board Games, Veranda Rocking Chairs Ideal For Enjoying The Tropical Breezes, And A Lazy River That Can Be Effortlessly Navigated Via Complimentary Inner Tubes. Click Here For Special Offers At The Pelican Grand Beach Resort!